This course provides an introduction to water exercise programming, including benefits of water exercise, safety, and incorporating water-specific equipment. Learn to design beginning to advanced water workouts for fitness, rehabilitation from injuries, and various health conditions. The Water Exercise continuing education course provides a thorough introduction to water exercise programming, including the properties of the water, benefits of water exercise, safety considerations, and instructions on incorporating water-specific equipment. This course allows personalization of each workout plan so you can change the speed, intensity, or amount of rest based on your clients’ needs. 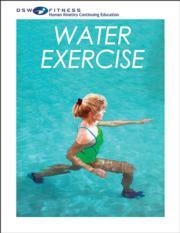 Water Exercise is ideal for cross-training workouts and beginning to advanced fitness workouts. It will also help your clients recover from injury or manage chronic conditions. With underwater photos and simple instructions for each exercise, you will learn fun exercises performed in shallow or deep water. You’ll also learn how to use optional equipment such as foam noodles and water buoys to strengthen muscles and improve flexibility. After completing this course, you will be able to design beginning to advanced aquatic workouts for fitness and rehabilitation from common injuries. In addition, you will learn appropriate water exercise protocols for various health conditions such as pregnancy, multiple sclerosis, Parkinson’s disease, muscular dystrophy, fibromyalgia, and rheumatoid arthritis. The workout plans allow you to progress or regress programs based on individual needs. The study guide contains a course syllabus, objectives, and end-of-chapter learning activities to prepare you for the continuing education exam at the conclusion of the course. The final exam consists of 50 multiple-choice and true-or-false questions that address concepts presented throughout the course materials. Define the properties of water that make aquatic exercise unique and beneficial for many populations, and identify the benefits of water exercise and guidelines for structuring, progressing, and regressing a program. Discuss the importance of the core for proper posture and safety of the spine, guidelines for determining repetition range, and application of the overload principle. Describe basic water exercises that focus on increasing joint range of motion and slightly elevating the heart rate. Describe intermediate exercises and explain the variables that lead to increased caloric expenditure, improved muscular strength and endurance, and greater core challenge. Learn how to progress water exercise programs by engaging muscles of the upper body, lower body, and core simultaneously while also challenging balance. Describe the common injuries and structure of major joints and the spine, and understand the water exercises recommended for rehabilitation of these joints with appropriate sets, reps or duration, and progression. Outline an introductory water exercise program to improve cardiorespiratory endurance, muscular endurance, muscular strength, and flexibility, and employ movement options to increase the intensity of the workout as fitness progresses. Discuss advanced aquatic training principles and the benefits of cross-training and interval training. Explain why clients who are pregnant or have multiple sclerosis, Parkinson’s disease, muscular dystrophy, fibromyalgia, and rheumatoid arthritis benefit from water exercise routines. A continuing education course for aquatic exercise and group fitness instructors, personal trainers, strength and conditioning coaches, athletic trainers, and fitness coaches. Melissa Layne holds a master’s degree in exercise physiology from Auburn University; a bachelor’s degree in physical education from Athens State University; a Georgia state teaching certificate; and fitness certifications through the Aquatic Exercise Association, the Aerobics and Fitness Association of America, and the American Council on Exercise. She has been a fitness director for several health clubs, head cheerleading coach, and an Americans with Disabilities Act specialist working with businesses to verify disability programs. Layne is on the faculty at the University of North Georgia in the physical education department. She presents at multiple industry conferences each year, where many of her sessions feature aquatic workouts. She teaches a dozen group exercise classes per week, including aqua classes. She has starred in two SCW Fitness Education DVDs and 12 Water in Motion instructional exercise DVDs.